Even as many job seekers struggle to find work, and policy makers put job creation as a major priority, certain fields have a different problem. Talent gaps cause problems in several industries, and STEM careers are among the most disadvantaged. STEM — Science, Technology, Engineering, and Math careers — are experiencing a talent gap caused by a variety of factors. First, the demand for STEM-capable employees is higher than ever, due to the ever-increasing importance and profitability of science and technology industries. Despite the increased demand, enrollments in STEM education programs remain lower than enrollments for other fields. Additionally, many STEM-capable employees are defecting to other fields, leaving the science and technology industries further deflated. There’s the overview. 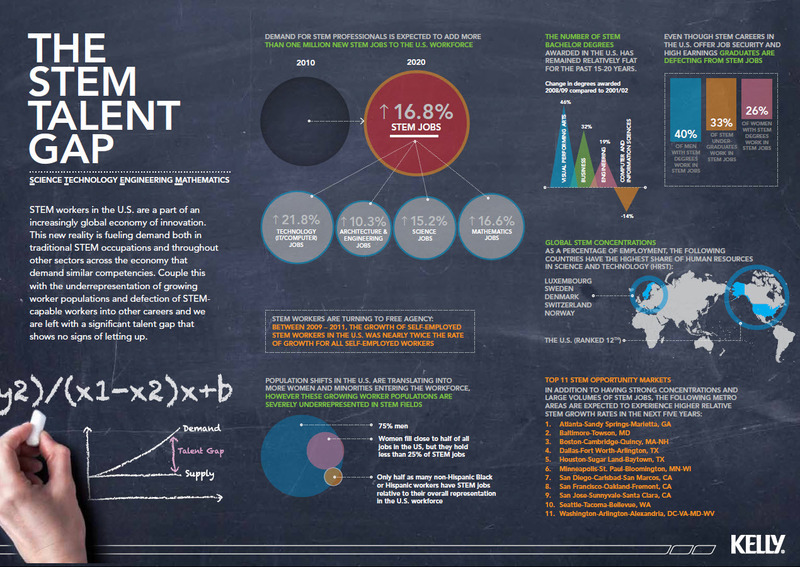 Now, let’s take a look at the STEM Talent Gap by the numbers with this infographic below. Between 2010 and 2020, jobs in STEM fields are expected to rise 16.8%: an addition of over one million STEM jobs to the U.S. workforce. More specifically, technology (IT/computer) jobs are expected to see a 21.8% increase, architecture and engineering 10.3%. Science jobs can expect a 15.2% increase, and mathematics jobs 16.6%. How does this compare with the trends in the kinds of college degrees that have been awarded? Here is where we begin to see the talent gap problem. The number of visual/performing arts degrees awarded has risen 46% between 2001 and 2009, while the number of computer/IT degrees has dropped 14%. Business and engineering degrees are both more common than they were 10 year ago, but the business degrees outstrip the engineering degrees in terms of growth. However, it appears that the lagging number of STEM degrees isn’t the biggest problem for the STEM talent gap. An alarming number of STEM degree-holders aren’t working in STEM fields. Only 40% of men with STEM degrees work in a STEM field. 33% of STEM undergraduates work in STEM jobs, and an astounding 26% of women holding STEM degrees do not work in a STEM field. Speaking of women in STEM careers: the talent gap is also a gender gap. Women make up close to half of the U.S. workforce, but occupy less than 25% of all STEM jobs. The numbers are similar for non-Hispanic Black or Hispanic workers: only half as many workers have STEM jobs, relative to their representation in the overall U.S. workforce. Why are STEM degree-holders defecting from STEM jobs? Why do 3 out of 4 women who hold a STEM degree choose not to use that degree? Clearly we all wish that we could be actors, or join the circus (read: rise in number of visual/performing arts degrees), but does this really account for the exodus from STEM fields? Let us know what you think in the comments below.